What better way to celebrate your bachelorette party than with a down to earth day out you’ll remember for years to come? We’d like to suggest delicious, fun brewery tours in the Santa Ynez Valley! Better yet, make a day of it. But don’t worry about getting around. Hire a fully-equipped party bus or decked out limousine and sit back, sip beer, and look forward to a day of beer tasting, just the way your bachelorette likes it. In fact, chauffeured transportation is the perfect way to enjoy the sights and breweries around Santa Ynez Valley. Our party buses and limousines are stocked with champagne and soft drinks to help kick off the day in style and keep your thirst quenched between breweries. Sant Ynez Valley is famed for its wine and wine tours alike. But the craft beer scene is rapidly on the rise. In fact, three major California craft beer players make their brews right in the heart of wine country. Besides the stunning breweries, there’s a whole host of specialty tasting rooms, restaurants, and bars, all offering international beer tastings. There’s even a specialty brew shop in the heart of Solvang, complete with classes and supplies for wannabe homebrewers. If you and your wedding party are big fans of beer, you might even want to consider booking your bachelorette party during the Santa Ynez Valley Craft Beer Month, which falls in May. It’s an entire month dedicated to celebrating all things beer along with tons of events and special offerings. When you book your bachelorette party with us, we’ll pick you and your crew up at your location and transport you in style in a luxurious limo, black car or party bus. If it’s a private tour you want, you get to pick the itinerary, otherwise, you can leave the planning to us as you and your party sit back and enjoy the festivities. 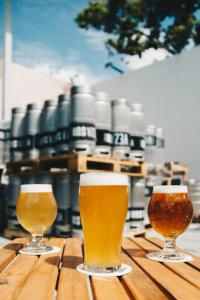 Whatever it may be, you can look forward to trying out a host of the finest craft breweries in the Santa Ynez Valley, learning all you need to know about beer, and of course, plenty of tasty samples. Book your bachelorette party with Silk Road Transportation today!